8 WEEKLY LESSONS ON GROUNDWORK : Debbi has seen how important ground work is to the healing of our veterans. Groundwork develops the trust and bond that the horse has with their veteran, and it provides the relationship that allows the veteran to truly lead their horse in exercises. Groundwork exercises include learning common horse behavior and traits; safety points; grooming/hoof care; desensitizing; leading, backing and yielding; flexing head and neck; and round-penning. ALSO 8 WEEKLY LESSONS ON MOUNTED RIDING: Successful riding is the prize earned from successful groundwork. Most veterans have never before been on horseback, and derive a huge boost in confidence and self-esteem from this. Lessons show them proper equipment methods; safety points; mounted balance; horse cues; one-rein emergency stop method; maneuvering obstacles; walk, trot and canter practice; mounting and dismounting. COMPREHENSIVE LESSON BOOK: Each lesson lists equipment needed; personnel needed; lesson objectives with measurements of success; lesson agenda; and debrief at end of lesson. Lots of pictures and diagrams show examples, and an appendix of forms and lesson tools complete the material you will need to implement this program. 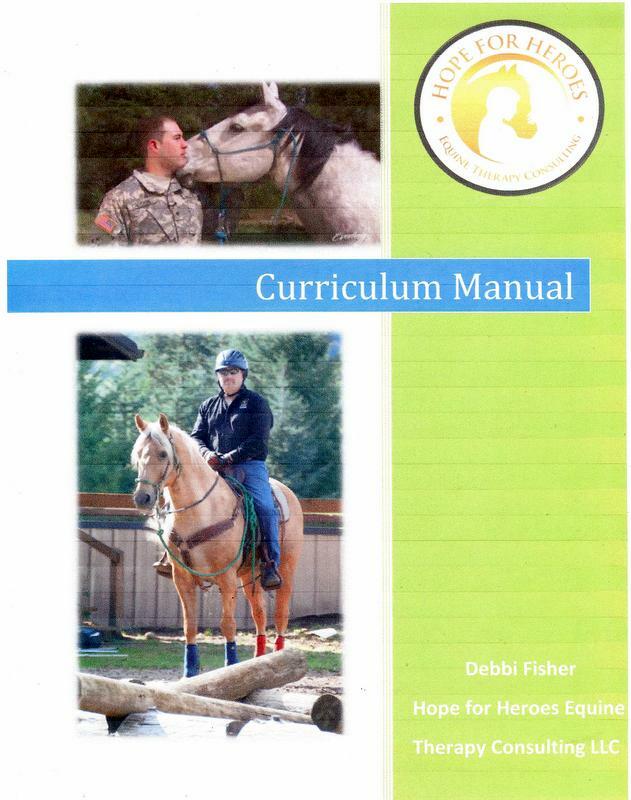 BAYLOR UNIVERSITY RESEARCH STUDY VALIDATION: Debbi created the lesson plan manual that was used by all the horse centers that were involved in the Baylor University Research Study to standardize all activities used by veterans in the study. The astounding results of this Baylor Study, that horses can reduce the PTSD symptoms in veterans by 50% in just 8 weekly classes, scientifically validates the methods used in these lesson plan manuals. 8 WEEKLY LESSON PLANS ON OBSTACLES: Lesson plans are designed to use the following basic obstacles: Rock, Log, Flat Bridge, Tipping Bridge, Trench, Water, Balance Beam, Gate, Texas Two Step, Poles, Backing Path. Each weekly lesson includes horse equipment needed, staffing requirements, lesson objectives and measurements for success, lesson agenda, and debrief wrap-up. Lots of pictures and diagrams of obstacles and horses/veterans negotiating them are provided. A great bibliography of supporting literature is provided for you to study to help you organize your own extreme obstacle site. VETERANS NEED ADVANCED LESSON MATERIAL: Veterans who complete months of horsemanship training become very accomplished horse people, and they look for additional horsemanship training to immerse themselves into. Veterans also love adrenaline because of their wartime experiences. Providing them with a challenging offering of advanced mountain obstacle training helps them hone their horsemanship skills and strengthens their trust relationship with their horse.